Battle Mecha Game Testers Wanted! 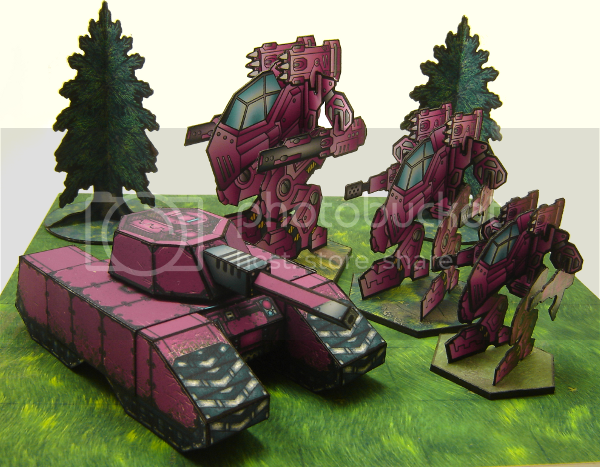 Battle Mecha, a game that Dagger has written and I have been working on miniatures for, will soon be ready for testing. If you would like to become a play tester stay tuned here for more information! The play test package is complete! It include the Battle Mecha rules written by Dagger, a set of basic mech models, and all the tokens needed to play the game. The game incorporates an amazing Armor Grid that gives the game a unique weapon damage system. Designed to have simple rules, the Battle Mecha game combines fast gameplay with strategic weapon choices to create a fun wargame of 15mm mecha combat. Please PM me or Dagger if you would like to be part of the game play test. All testers will receive a complimentary copy of the game and miniatures. Please note, as part of the play test you have to complete a simple feedback form and email us a photograph of the Battle Mecha game in progress. I forgot to mention: If your interested in being a game tester, please PM me or Dagger with your email address so we can send you the game files. Thanks! This looks to be a neat game. What is your time frame for play-testing, how many players does the game support, and what is the average length of play? WaffleM is putting together the last of the models now... so I was hoping to get some constructive criticism and have the rules nice and polished in the next couple of months. Like any skirmish game, it works best with two players... but the game can accommodate more players and still keep everyone interested because of the alternating turn sequence. The length of game play averages about an hour... but it really depends on the size of the game. You can plan a small tactical skirmish or an all out strategic battle royal. It's going to be worth getting the game just for the models alone... WaffleM has done an amazing job putting them together. I think everyone will like the Armor Grid too. It makes it so that your game-strategy begins the moment you start deciding which weapons to put on your Mecha. Is it okay to post test build and gaming picy's etc into your forum or do you want to keep it all under wraps so to speak? I've test built quiet a few mecha but no way I can build enough for the size games i want to try out and number of players so I put the below flats together, there pretty basic (didin't want to spend to much time on it) but I thought others might find them useful for play testing. (If anyone desperately needs another colour I'm happy to run another colour off). Yep just big Gif's but not many colours. Incase of problems the image should be 181.86mmx261.11mm. That's fine by me. Posting pics helps generate excitement for the project and it can also help illustrate any questions that you may have. I like that you made your own game tokens too. This will help facillitate your game testing on a larger scale than I anticipated. did a 2hvy and 2 Med mecha (red) vs 3 Light and 2 med mecha and 2 tanks (blue). In the end the red crew won, but it was close they got two lucky crits while there mecha kept getting same crit area destroyed rolls. the two tanks both survived but both had there turrets blown off so they were no good for anything. The red crew had a almost fresh med mecha and one fairly heavily damage heavy mecha left at the end. The game flowed quiet well and early on it looked like blue was going to stomp red but those heavy mecha can take a pounding and they dropped a med and light blue mecha in the 3rd and 4th round with single crit mecha destroyed rolls after that it was all down hill for blue. It did raise a couple of questions. I assume crit rolls and results occur straight away so a mecha/vehicle can lose weapons before it gets a turn? If a mecha is equipped with all laser weapons can it's ammo explode? Missiles blow armour out but what happens if they hit a high spot does the splash damage do nothing or flow down into the holes? (hope that makes sense). If a missile hits slot 10 or 1 the side splash damage is lost? I made the assumption if a vehicles turret is destroyed so is it's weapon, hope that's correct. the map didn't favor light mecha as no cover just a few big buildings, although they did get a couple of rear shots in. Yep... weapon damage is resolved immediately. Because of the alternating turn sequence it's highly unlikely that your team will lose much before you get a chance to fight back. Simply apply the damage template as is. Basically the explosion comes into contact with less of the mecha, so destroys less armor. Yep... it was a glancing shot, not a solid hit. HC - You had it right the first time. Except that the damage is not "wasted", it's just that the missile blast expanded into an area that was no longer occupied by armor plating. Simply apply the damage profile of the weapon at the hit location and remove any good armor under the "template" of the damage profile. Played a few games now about 4, with others, so I'll send through the feedback document today. It's quiet big but please don't take this as an indication that we didn't enjoy the game . Most of it is thoughts and ideas on ways to improve the rules from our point of view. The game was very enjoyable and reasonably fast, we seem to average between 90mins and 3 hours for a game with bp's in the realm of 50-70, A lot of time was spent discussing mechanics and thoughts etc so those times will be a little bloated. Well "group" is stretching the word a little theres four of us . For those curious there based to circles (force of habit) but you can see one's sitting on hex magnet adapter base for gameplay. I'm still waiting on me to finish those too! The delay has been due to packing and getting ready for the big move this weekend. I should be able to crank these out in the next two weeks, as my commute will be changing from fifty minutes down to five! Yay! Free time again!!! The Big mecha actually is more intimidating in person vs the tank, I stuck him at the back so perspective is making the tank look more forbidding than it really is. Hmm to put it another way if I was in a light mecha I'd think twice before taking on a tank, but in a medium or heavy bring it on. (purely from a looks view point not a stats view). Tank bigger than mecha easy one to explain away. Mecha use cutting edge technology in there construction which is smaller lighter and more compact and more expensive (hence lots of guns). Tanks use older but bigger components but there overall cheaper hence the tanks come out larger. But trust me the hvy mecha looks more than intimidating enough against a tank (mecha is as tall as the tank is long)...I'll try and get a better picy tonight . That does raise another question from me, are you planning on releasing rules and minis all as 1 game pack (similar to wwg>wormhole) or more standalone rules with some card elements to get you going but then sub in any miniatures you want card/plastic/metal? Depending on the end goal i'll adjust all my future feedback to match as the two end uses do have slightly different requirements. Only got 1 game in, I took some photos but you'll have to forgive the terrain as all my current terrain is in 25mm scale only just recently decided to jump across to 15/18mm for everything . We wanted to test out troops with the changes. We also incorporated a move/fire or fire/move option. You simply declared for each unit what your going to do then did it ie Fire/move or move/fire or standfast and fire. It worked very well and made them gameplay slightly more tactical but didn't slow gameplay down noticeably. All Troopers were standard light infantry unfortunatly I took a mix of weapons something that contributed to the troopers losing th game. The Light mecha were customized builds (and assuming we interpreted the rules right) had all missiles and 4 rows of extra armour, very tough. Second Round - Light red mecha won imitative but the troopers dished out a massive 12 box's of damage for some light damage in return. Troops are running for the trees as cover. Fifth Round - Troopers won and received light damage and dished out a moderate amount of damage in return. 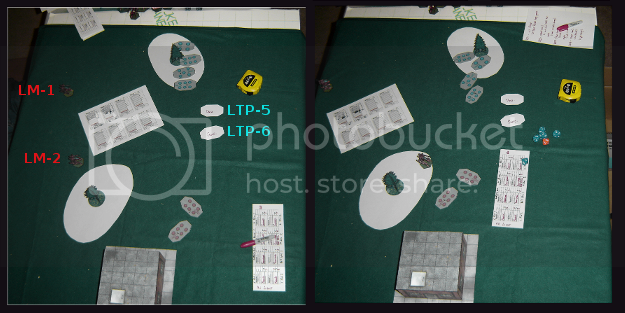 Sixth Round - Mecha won and killed another unit of troopers and recieved only light damage in return. Seventh Round -Mecha won and kileld anothe runit and dished out damage to several of the other troop units they recieved no damage in return. Eight Round - Both LM1 and the troop unit close to it fired at each other but missed. Round Nine - Troopers won and recieved a few more hits against them mostly knocking out crew served weapons . They got lucky against one of the mecha peeling out 7-8 boxs of damage. Round Ten - Troopers won and one hit with a MG it was enough to knock one weapon of off LM-1 but the mecha killed another one of the troop units. It was pretty much all over for the troopers in these last two rounds but they made suicide attacks against LM-1 trying to knock it out but the extra armour was just to hard to penetrate. 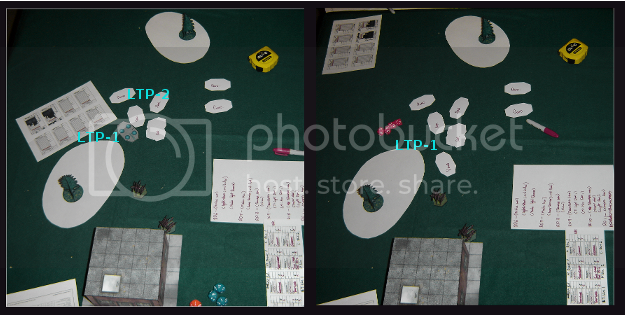 Crit table - re-rolling was really good as there was quiet a few times were the mecha scored multiple crew served weapon destroyed. Troopers to Lower Tp - Softened them enough but they were still hard to hit. 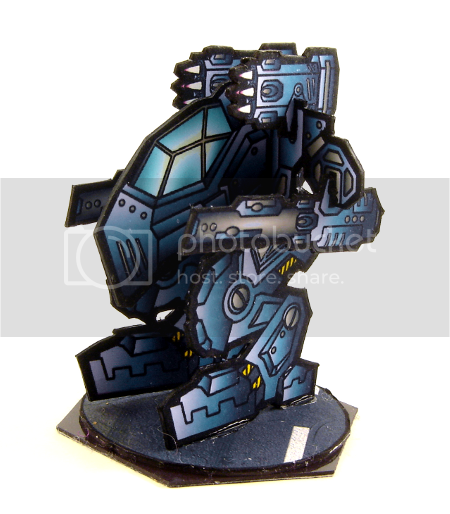 Build Rules for mecha very nice although we have some questions, is it okay to post them here or rather via email? 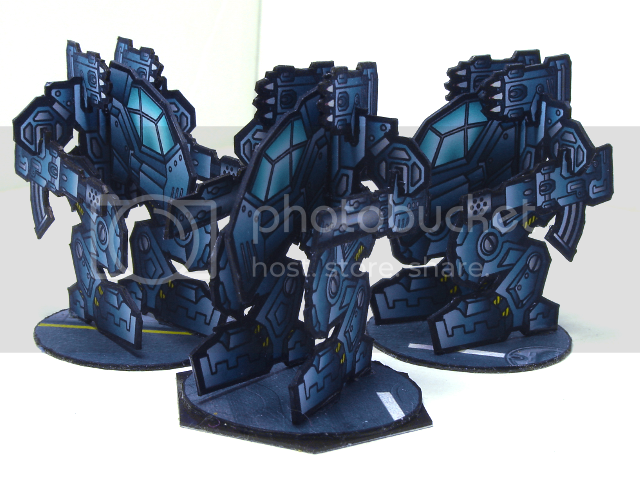 The light mecha were deliberately built as troop killers with extra armour and weapons they could fire at max range. The ability for the mecha to fire and them move really enabled them to make the most of there movement advantage and shoot the troops and then move out of range, suffering minimal return damage, although one almost died, if they'd not had extra armour Lm-1 would have definitely been dead and Lm-2 seriously damaged. Although it looks like from the above the troops got stomped it was actually fairly close and if the troopers had taken more missile weapons and less messing around with er other weapons it may have been a different story. Still not sure about tanks, pretty certain they would have got stomped by either of the above two forces but we'll try that next weekend . Yep we definitely messed up on those mecha...no wonder I struggled..hmm we'll re-do that game over and get back to you ...we'll do stock fire/move. Thinking about it, it definitely would have slide the game back into troopers favour, not sure if it would have been to much, I'll check the photo originals and see what round/turn LM-1 would have started taking crits. Ahh didn't realize it was all simultaneous, figured it was just one unit getting a slight edge/drop on another etc. Yes if you declared a Fire/Move which was to be a run you took a penality, this wasn't much extra effort about the same as tracking your heat so you don't overheat. "If you kill 'em they ain't gonna learn nothin'." Just got the files! I give it a go this weekend and let you know what I think. Join the Dark Side. They have cookies! Just got done with our first trail run of the game. We had a BLAST! To get a handle on the rules we (there were four of us) decided to each take control of 1 medium mech and deck them each out with a variety of medium-sized weapons. We did this mainly to get a handle on the Armor Grid system and mechanics. Let's just say that the Armor Grid system is ingenious! We had such a great time waiting with bated breath each time a weapon hit to see where it landed and what damage was caused. Great job on this! 2. Could you explain how the "Ammo Explosion: D10 Damage (Random Hit Location)" on the Mecha Critical Heat Table works? The way we played tonight was we rolled a D10 and then took away one Armor Grid square where the die indicated. Is this right? 3. We didn't see much difference between the different weapon designations (Light, Medium, and Heavy). The only difference on the majority of these was the Damage Profile only. For example, it seemed to us that a Heavy Laser should be rated at a Hv3 while the Medium and light Laser at a Hv2 rather than a Hv2 for all three. We just thought that there should be more of a difference between the light, medium, and heavy. 4. Say your mech equipped with the Remote-Guided Missile System is activated first and scores a lock-on. But before you next activation that mech is destroyed (lucky shot)... Is the RGMS effect still good for the rest of the round or does it go up in smoke with the Mech? 5. When choosing weapons, is there a specific cost to each weapon or are the costs factored into the Bp already? Could I choose to have for HardPoints of Missles and then on another mech have 4 HardPoints of Lasers? And then on the next mix and match? I think that's all the questions I have for now... We'll be playing again very soon, so look for actual pictures and more questions next week! I'm very glad that you enjoyed it... and thanks for taking the time to try it out. I have version 2 of the playtest rules ready based on some feedback from other playtesters... I'll send those over to you. You have some very good questions... and I think you've pointed out some sticky points in the rules that I need to clarify. The Critical Systems Area is not part of the Armor Grid... it is not made up of blocks that are scratched out when hit. The Critical Systems Area is one big area that generates a roll on the Critical Hit Table each time it is hit. It doesn't matter what weapon hit it, it only matters that it was hit. So if the Critical Systems Area is hit, simply make a single roll on the Critical Systems Area. Keep in mind that Machine Gun damage is made up of multiple hits, so may generate multiple critical hits. That's a very good question... one that I hope to answer with playtesting. I like the potential of both situations. If the RGMS effect ends when the Mecha is destroyed I like how the RGMS equipped Mecha becomes a "high value target" for the rest of the round. If the RGMS effect lives on when the Mecha is destroyed (the target location data has already been sent to all friendly units) then that increases the value of an RGMS... but does it increase it too much? Feel free to play it both ways and let me know which you prefer. In the base game you simply choose weapons within the appropriate size of your Mehca... their price is included in the price of the Mehca. You may certainly mix and match... You should be mixing and matching and thinking about how the weapons work together to help you get through the target's Armor Grid. There is an Optional Rule for building custom mechs which would allow you to take smaller or fewer weapons and upgrade armor or the engine.